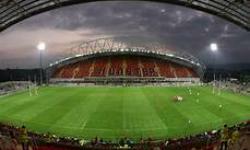 Thomond Park Stadium in Limerick, Ireland is your ultimate venue home ground of Munster Rugby, and internationally renowned for it's unique history and atmosphere, now redeveloped with an increased capacity of 25,600. 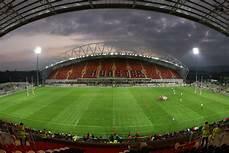 With award winning design and architecture, this Stadium is also a modern venue for hospitality and conferencing featuring state of the art technology and banqueting facilities, they have in the past hosted exhibitions, seminars, product launches, business meetings, gala dinners, training events, balls, fashions shows, weddings and more. 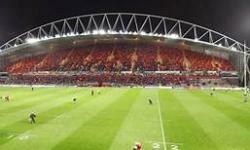 Thomond Park Stadium also features a fascinating interactive museum experience showcasing the proud history of Munster Rugby, and there are interactive displays and touch screens for all ages. Book a Stadium tour with a museum visit and see behind the scenes of this historic Stadium, a must.